So I recently picked up a compete 38mm SSS carburetor setup from a 610 with the k14 manifold and all the linkage etc. Any reason I should sway one way or another? I should mention these carbs would be going on a L20b with the w58 head if I kept them. I don’t mind head work, valves/cam etc as I know I would be doing the same with a draw through. Any chance you can make those SUs work with a turbo? Or are you looking for something that is more bolt on? Run dual SUs on that intake or get a larger single carb for a draw through. Plumbing dual carbs on a draw through will be a nightmare to do and tune. Keep it simple. Are the SU’s sufficient for a blow through set up? I was curious about how well they would handle positive pressure. I suppose having the guys at ztherepy replace the bushings on the housings would reduce the chances for a leak, but I honestly don’t know as much as I would like to know about SU’s. Has anyone successfully run a dual SU blow through turbo set up? Draw through is easier. Blow through you would need the fuel pressure to increase with boost. .
A rising rate fuel pressure regulator and electric fuel pump would make quick work of that issue, but since I’ve got a hp number in mind....I guess back to my original question, will the SU’s be enough to make the power I want reliably? I don’t feel like 150hp+ to the wheels is asking a whole heck of a lot out of an L20 considering it will be completely torn down and rebuilt to whatever I decided to do. My concern with the 38’s is that they won’t keep up with the fuel requirements on the top end. 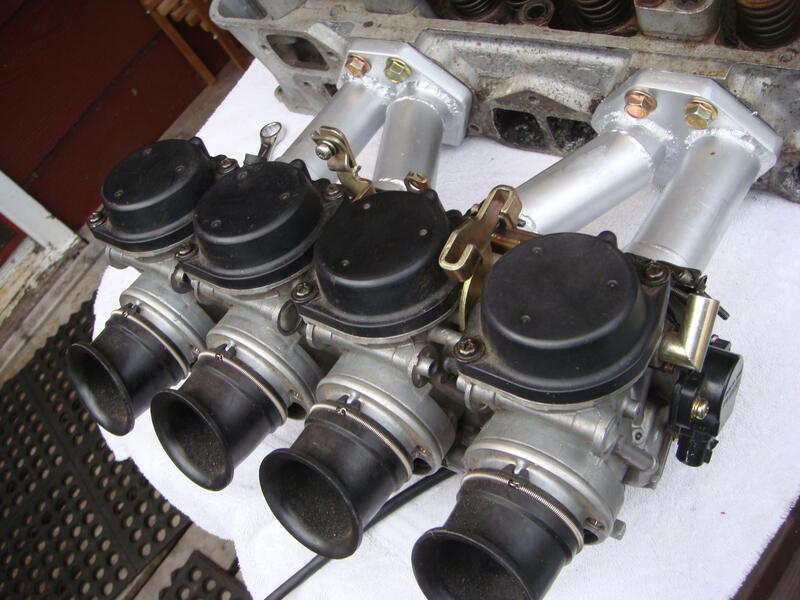 46mm carbs are availible from ztherepy and I guess that’s always an option as they look almost identical and only cost a few hundred little more than having mine rebuilt. Driveability isn’t too much of a concern, I honestly only take the truck out a couple times a year for fun. If it was making more power I would consider racing it, as the truck sits though our track in Portland would be a little boring. 92 octane is about the easiest to find around here and E85 is readily availible although I haven’t heard of anyone using it on a datsun, I ran it in my Mitsubishi evolution with a few couple bolt ons and a day tuning at English racing and made around 400whp and 370tq. If the 150 rwhp number is your goal, you're not going to do it with SU's. So you need to ask yourself, what do I really want? I would go for the horsepower, but I wouldn't do it with a turbo L series. I'd do a KA swap with EFI. If you're willing to deal with the tuning and hassle of owning an old school, analog, mechanical turbo and carburetor system, then go for it, but beware the pit of despair. For $5k u probably could do a KA swap and get a very reliable runner stock. If L is your route, gotta use 46mm SU's and poor all the money into the head, porting, welding the combustion chambers, larger valves, cam, valve train, etc., need a good honest 10.0 to 1 compression but the KA would probably still be faster. I’m not worried about a ka being faster, and I’m really not worried about the money it costs to do it. Simply if the 38mm SU carbs would support 150hp out of a built L motor. A custom 2200 or 2300 with dual SU's... I would guess maybe close to 190hp on the engine dyno. Are you opposed to the sight of a KA? and you just want to stay with the L series valve cover look? One neat trick is to build a KA/Z24. Using most of the Z24 bottom and front cover, oil pan, water pump, accessory drive, it is possible to bolt up a 12 valve KA24 head. I have done this a couple times, though quite a long time ago. I know it's a long way around to having a KA24, but it looks more appropriate under the hood with all the L series front drive and water pump. You could even go another step and make a custom SU intake and run a L series distributor too. 38's aren't going to cut it for what you want. Look at U20 engine specs that uses 46 SU's, 9.5 compression, 1.75 intake ports, 1.75 in valves, 1.38 ex valves, plus a large bore to allow it to breath. That last part, a large bore, The U20 had a 87+mm bore stock. That’s more like it. I want to keep the L series look there, but I don’t want to do the same old dual Weber’s or mikunis. Why not a Z24 with L head on it? Scaling up an L20B to 2.4 liters this is a 20% increase. If an L20B makes 95 hp then 20% more would be 115 hp just from the displacement increase. A open chamber L head produces a 9.45 compression so add a few more hp to that. 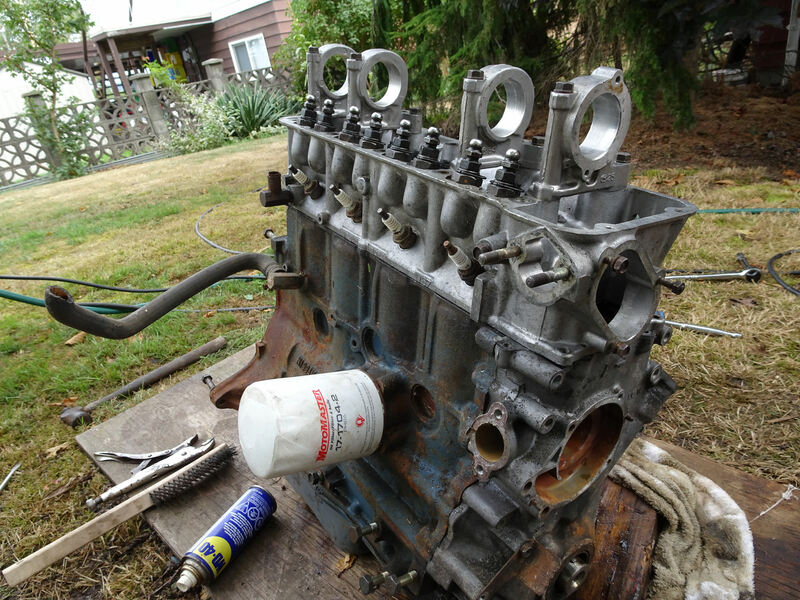 If you want it to look like an L series it has L engine mounts, oil pan, head and valve cover and both L manifolds plus a matchbox distributor from a '79 620 truck.. Technically it's a Z24 timing cover but can you tell the difference? No one will notice that it's 3/4" taller than an L20B. The compression is now around 9.2 but the increase in breathing will more than off set the small loss in compression.... and I haven't even got to the .480 lift Isky cam. Thank you mike, this is the kind of info I was looking for. I really like seeing the L series valve cover in there and whatever I can do to make some power without it looking aftermarket was the goal. Just out of curiousity, did you cc the head? Also wondering if there was a particular head/bottom end I should look for? If I remember not all z24 motors were the same? Easily done. 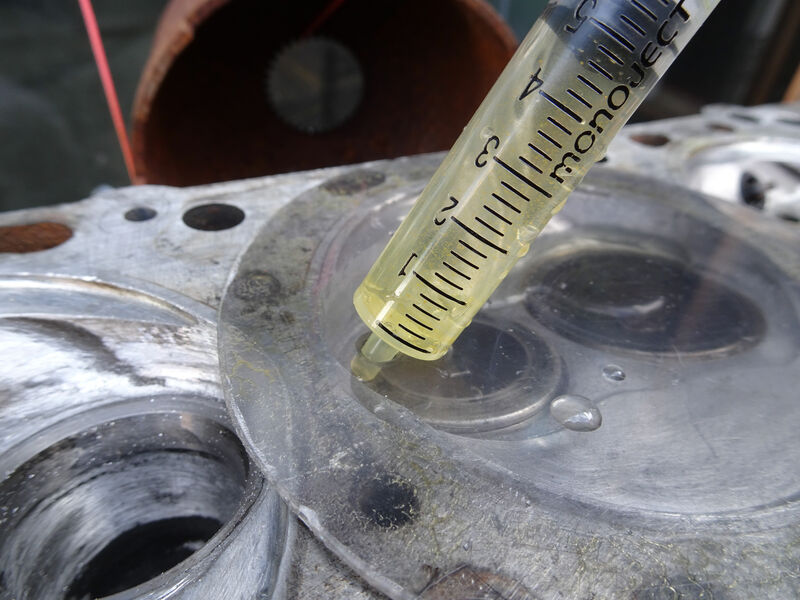 Piece of clear plastic, child's liquid medicine dropper and some grease to seal the valves and plastic. Put the hole near one edge and tilt it up so the air gets out. 9 X 5cc plus 2.5 to 3 extra cc for about 48cc. There was a Z24 and a Z24i which had throttle body fuel injection but the heads and below the heads they were the same. You would be putting an L head on anyway. 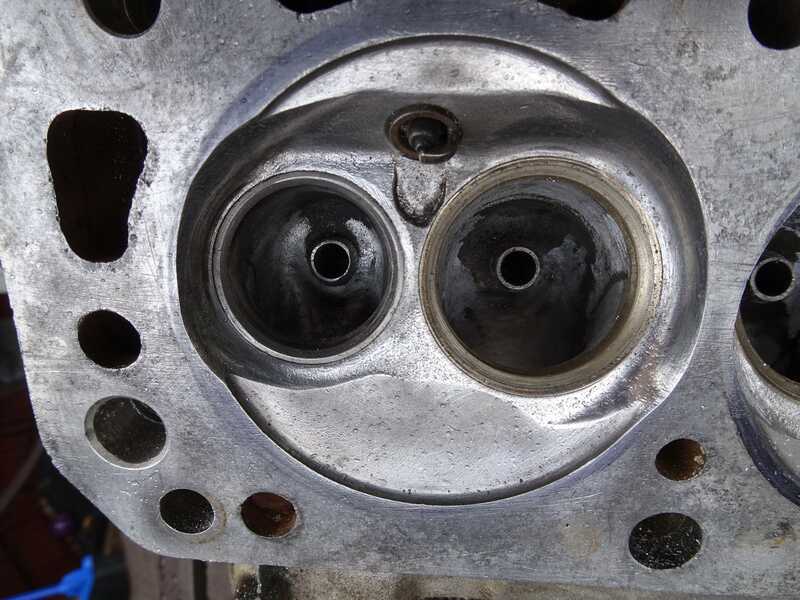 Since compression isn't a problem it's safe to open up the combustion chambers around the valve by placing a new 89 mm Z24 head gasket on an scratching a line that limits any grinding. When done I was surprised to find they were only 48cc or so. The timing chain needs lengthening by two full links, also easily done. For a head you have many choices but the most common is the U67 from an L20B. You could also use a W58 from the '78 and up L20Bs if all that's available but it has exhaust liners and round rather than square exhaust ports. The liners could be cut out after removing the valves. An A87 will also work but it's really an L18 head with smaller ports and sometimes smaller valves. I'm going with the U-67 because the square ports will match the L16 stock square port cast iron header I have. The W58 round port head will work with a square exhaust manifold but obviously don't match as well. Both U67 and W58 have the same size valves and open combustion chamber needed to flow 400cc more and keep the compression down. I vote for the Weber 32/36 on a "U" manifold draw-through setup, recurved distributor, and all the other fun motor parts to make it work right. Mike, what I currently have is a 78’ 620 with what I thought came with a square (not circular) exhaust port W58? I’m no stranger to head work, pulling the exhaust shields in the head and welding any issues that might arise from doing that certainly isn’t a problem. Aha! one person to chime in on going the trurbo route.